Space for your ammo box up to 9" x 17.75"
Please specify your choice (Natural or Painted Black Wheels) in the comment box that appears during the checkout process. 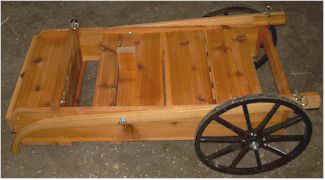 The Amish-made wooden Gun Cart is constructed with Western Cedar Wood. It can hold 5 guns that are securely locked into place. At the top and bottom rear are compartments for storage. The bottom front has enough space for your own ammo box - up to 9" x 17.75". 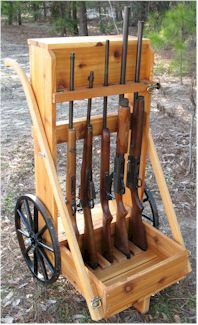 The gun cart folds up nicely for easy transporting and storage... no tools required. The wheels can be removed for tighter spaces. 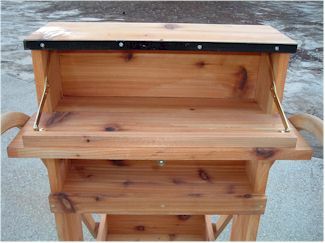 Top Storage Compartment with Center Shelf below. 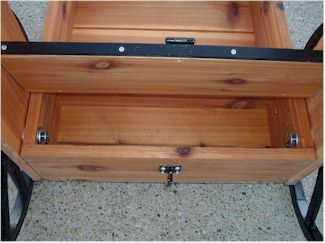 Top storage inside dimensions = 4.75" deep x 19" wide x 7" high. 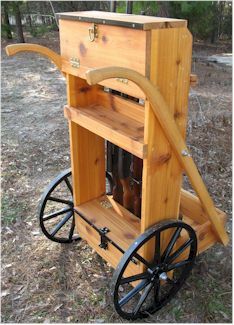 Gun Cart folds to 50" x 18" x 29" wide with wheels attached. Wheels are removable. 50"x 11" x 23" wide without wheels. No tools required.